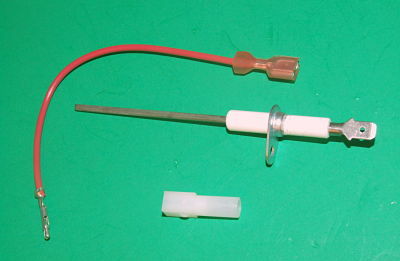 Flame Sensor used in Armstrong; Coleman; Evcon; Hail; Intercity Products; Intertherm; Lennox; Modine; Nordyne; York equipment. Replaces Part Numbers: 903600; 632143; 632316; 632396. Used in Armstrong; Coleman; Lennox; York Models: G1D80 series; G1D91 series; G1D93 series; G1N80 series; G2D80 series; G2D95 series; CG80 series; CG90 series; G5RA series; D1GA; D1GH; D2GA; D2GH; D3GA; D3GH; D4YS; D5YS; DARA; DARH; DBRA; DBRH; DCHG; DCRA; DCRH; DDHG; DEHG; DGD-A; DGD-B;FL8; G8D; G8T; G8V; GDD; L8T; L8V; P1CK; P1CX; P1DD; P1DU; P2CD; P2DP; P2DU; P2MP; P3DN; P3GE; P3HU; P4DN; P4HU; P9CK; P9MP; PACE; PACR; PBKD; PBKM; PBND; PCDF; PCUH; PCMU; PCMD; PAND; PBNU; CGU09516; CGUO9516; D2GA018N03206B; D2GA036N06406B; D2GA036N06406C; D2GA030N06406C; D2GA036NO8006C; D5YSO24NO4506A; D5YS024N04506A; DBRA-F036N100C; G1N80BU075D12A; G4RA072C-12; G5RA096-C-16; G1N80AR075D12A-1A; G8T10020UHC11A; G8T10012DNB11A; G8T100012DNB11A; G8T04012UHA11A; G8T06012UHA11A; G8T08012UHA11A; G8T08016UHB11A; GM8S040A12DH11A; GM85040A12DH11A; GM85080A12UH11; GM8S080A12UH11; GM8S080A12UH11A; P1CCD12N06101A; P1CCD12N06101B; P1CCD12N06101C; P1CCD12N06101D; P1CDD10N05701A; P1CXD16N09201A; P1CXD16109601A; P1DUC20V08001B; P2DPD16N08001C; P2MPD12N06401B; P2MPD16N06401A; P2MPD16H06401A; P2MPD08N04801B; P2MPD20N09601A; P2MPD20NO9601A; P2MPD20N08001C; P2MPD12N04801G; P2MPD14N08001C; P2MP014M08001C; P2MPD12N06401A; P2MP012H06401A; P2MPD08L03201B; P2MPD08L03201A; P2MPD08L03201; P2UDD10N05701A; P2UDD16P11401C; P2UDD16P07601C; P3CCD12N06101A; P3HUA12N04801A; P3HUA12N04801C; P3HUC20N08001N; P3HUC20N08001A; P3HUC20N08001; P3HUC16N09018; P3HUA12N06401A; P3HUC16N09201A; P3UCD08N06101A; P3UCD12N06101A; P3UCD20M09101A; P3UCD20N09101A; P3HUB16N08001A; P3HUB12N08001A; P4DNA12N06401A; P4HUA12N03201A; P4HUA12N04801A; P4HUA12N06401A; P4HUB16N06401A; PACELD16N120A; PAND-LD10N060; PBKM-LD12N060E; PBKMLD12N060E; PBKDLD10N060A; PBKM-LD20N140E; PBKMLD20N140E; PBKM-LD12N060E; PBKMLD12N060E; PBKM-LD12NO60E; PBKM-LD12N080F; PBKM-LD12MQBQF; PBKMLD12N080F; PBNU-LD12P080A; PBNULD12P080A; PBNU-LD20P100D; PBNU-LD10N060D; PCDFALD12N080B; PCMD-LD12L076B; PCMDLD12L076B; PCM0-L012N076B; PCMO-L012N076B; PCMU-LD12N095B; PCUHBLD12N100A; PCUHBLD12N100B; PCUHBLD12N100C; PCUHALD12N080A; PCUHALD12N080C; PCUHDLD20N130A; PCUHDLD20N130B; PCUHDLD20N130C; RGU80A75D10-3A; RGU80A1000D14-3A; RGU80A100D143A. Used in Intertherm; Nordyne Models: G3RC series; G5RC series; G6RA Series; FG6RK0726-12; FG6RK0726-12A; FR6RA-0450-08A; FR6RA045008A; G1D93AC067D12B-1; G1D93AC067D12B1; G3RK072A-13; G3RK072A13; G6RA096C16B; G6RA096C16A; G6RAO96C16B; G4RA072C-12; G6RA120C-20; G6RA120C20; M2RC-080A16BN; M2RC-080A-BN. Used in Intercity Products: GDI050; GDI075; GDI100; GDI125; GDI150; GNI045; GNI060; GNI080; GNI100; GNI120; GNJ050; GNJ075; GNJ100; GNJ125; GNJ150; GUI050; GUI075; GUI100; GUI125; GUI150; G5RA096-16; G5RA096-16C; 65RA096-16C; G5RA096-C-16; G5RA096-16; G5RA096-16C; 65RA096-16C ;65RA096C-16; G5RA096C-16; GDI050A012AIM; GDI050A012AIN; GDI050A012AINW; GDI050A012BIN; GDI050A012CIN; GDI050A012IM; GDI050A012IN; GDI050A012INW; GDI075A012AIM; GDI075A012AIN; GDI075A012AINW; GDI075A012BIN; GDI075A012CIN; GDI075A012IM; GDI075A012IN; GDI075A012INW; GDI075A016AIM; GDI075A016AIN; GDI075A016AINW; GDI075A016BIN; GDI075A016CIN; GDI075A016IN; GDI075A016INW; GDI100A012AIM; GDI100A012AIN; GDI100A012AINW; GDI100A012BIN; GDI100A012CIN; GDI100A012IM; GDI100A012IN; GDI100A012INW; GDI100A016AIM; GDI100A016AIN; GDI100A016AINW; GDI100A016BIN; GDI100A016CIN; GDI100A016IM; GDI100A016IN; GDI100A016INW; GDI100A020AIN; GDI100A020AINW; GDI100A020BIN; GDI100A020CIN; GDI100A020IN; GDI100A020INW; GDI125A020AIM; GDI125A020AIN; GDI125A020BIN; GDI125A020CIN; GDI125A020IN; GDI125A020INW; GDI150A020AIM; GDI150A020AIN; GDI150A020BIN; GDI150A020IN; GDI150A020INW; GNI045A012AIN; GNI045A012BIN; GNI045A012CIN; GNI045A012DIN; GNI045A012IN; GNI060A012AIN; GNI060A012BIN; GNI060A012CIN; GNI060A012DIN; GNI060A012IN; GNI080A012AIN; GNI080A012BIN; GNI080A012CIN; GNI080A012DIN; GNI080A016AIN; GNI080A016BIN; GNI080A016CIN; GNI080A016DIN; GNI080A016IN; GNI080AGAIN; GNI100A016AIN; GNI100A016BIN; GNI100A016CIN; GNI100A016DIN; GNI100A016IN; GNI100A020BIN; GNI100A020CIN; GNI100A020DIN; GNI120A020AIN; GNI120A020BIN; GNI120A020CIN; GNI120A020DIN; GNI120A020IN; GNJ050A012IN; GNJ075A012IN; GNJ075A016IN; GNJ100A012IN; GNJ100A016IN; GNJ100A020IN; GNJ125A020IN; GNJ150A020IN; GUI050A012AIN; GUI050A012BIM; GUI050A012BIN; GUI050A012FIN; GUI050A012HIN; GUI050A012IN; GUI075A012AIN; GUI075A012BIN; GUI075A012HIN; GUI075A012IN; GUI075A016AIN; GUI075A016BIM; GUI075A016FIN; GUI075A016HIN; GUI075A016IN; GUI100A012AIN; GUI100A012BIN; GUI100A012FIN; GUI100A012HIN; GUI100A012IN; GUI100A016AIN; GUI100A016BIN; GUI100A016FIN ;GUI100A016HIN; GUI100A016IN; GUI100A020AIN; GUI100A020BIM; GUI100A020FIN; GUI100A020HIN; GUI100A020IN; GUI100A012BIN; GUI100A020AIM; GUI100AJAIM; GUI125A020AIN; GUI125A020BIN; GUI125A020FIN; GUI125A020HIN; GUI125A020IN; GUI150A020AIN; GUI150A020BIN; GUI150A020FIN; GUI150A020HIN; GUI150A020IN.